Home Blog How Video Content Is Emerging As the Next Big Thing? Video content is emerging as the next big thing in the world. According to a survey, till 2017, people have been spending a mammoth 5.8 hours watching video every day. 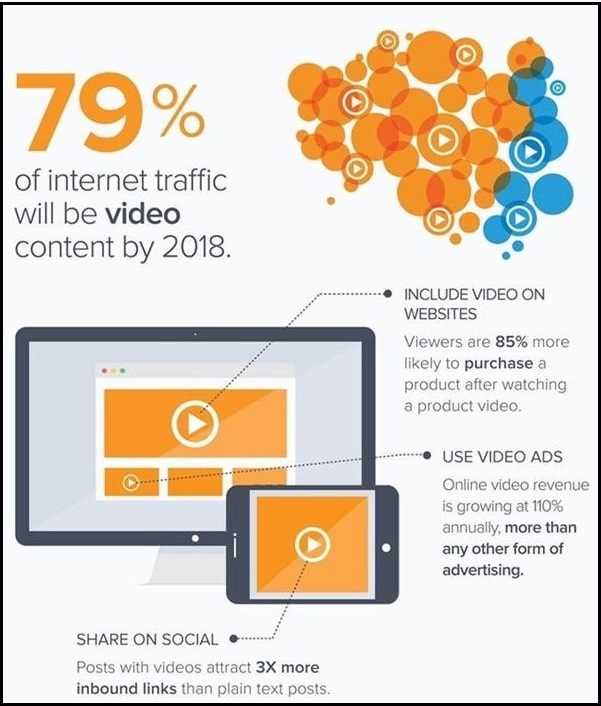 And it is estimated that by another year, 72% of the viewers will be switching to video. No wonder 50% of advertisers have already started investing their time and money from TV to high quality videos. When it comes to India, with the huge surge in the use of smartphones, combined with widespread proliferation of the 4G network at minimum cost, video content has a great potential to boom. Various metrics like view count, click-through-rate, social sharing and conversion rate are there to measure the impact of video content on the mass at large. These user metrics can tell us the benefits associated with video engagement and measure its success. Whether for entertainment or education, video content has always been very popular. But the only obstacle till 2017 has been expensive data plans and low internet speed. But all that is now history. With Jio changing the game for mobile connectivity, the mass has now been empowered at minimum expense. Coupled with smartphone penetration to an all-time high, video content is just on the brink of booming big time. Videos are ideal for delivering education. In India, along with the recent reduction in mobile connectivity costs, there has been a massive surge in video-based learning. Also rural learning in India will increase with this change in connectivity and costs. Transportation and lack of infrastructure been a constraint, video-based content will be a definite enabler for enhanced collaboration, stimulated discussions for education in India. GIFs and animated stickers are the most effective and appealing, driving engagement and trending big time on social media. Because of video-based content, edu-tech companies are connecting with their target groups better on several platforms. Creative digital videos are being used for branding and advertisements. Prompted by shares, comments, likes, views and visits, videos today is the ideal tool for maximum traction at minimum cost. If you are looking at enhanced digital engagement with your target audience for higher sales and revenue, please feel free to give us a call – we are a content marketing company of repute. Get in touch with us at sales@ikf.co.in or contact us @+91-888 886 6110.